A cake firework, also known as a candle barrage is a firework comprising a series of roman candles or single shot tubes connected together. Typically, the internal fusing is set to fire each tube in series, or to fire several tubes at the same time, or a combination of these. 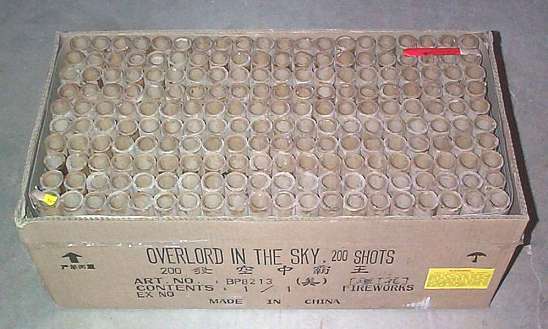 Typically a cake will resemble from the outside a simple cube or other rectangular covered shape; after detonation, a large number of cardboard tubes (the candles) will be visible in the top of the firework (the paper cover having been blown off by the discharging stars). In a traditional cake, all the candles point upwards; a variant is called the fan or angle cake. Cakes are one of the most popular types of firework, as they can create spectacular and long-lasting effects from a single ignition while minimising safety concern. In the United Kingdom, the reclassification of aerial shells to Category 4 has popularised cakes as a method for achieving similar effects while staying within safety guidelines, particularly by firing multiple candles at the same time. The cake described here consists of a paper tube that is tightly sealed by a clay end plug on one side. Inside the paper tube, a lift charge and some stars are placed. The process is repeated for a number of tubes and then they are fused together with a sufficient length of visco fuse. The tubes are then bound together and device is glued to a wooden base for stability. When the cake is fired, the fuse ignites each tube one at a time and the stars are shot upwards into the sky.